It’s a bird! It’s a plane! It’s an experiential overview! I respect your honesty however you choose to write or not write about the Sport-Brella–with humor and neurosis is fine. Thank you for your consideration. I would be happy to send you a complimentary product for review. I can send you a red one to go with your hat and swimsuit–oh wait, is that a rendering or photo? 3) The product to be reviewed garners me admiring glances. 4) The product to be reviewed is not already owned by our best friend rich couple who buys The Rock and I such things as beds, and computers, and TVs and stainless steel countertop appliances and who we never ever know what to get them in return because they HAVE EVERYTHING IN THE FREE WORLD. And in space. So guess what? Yep! 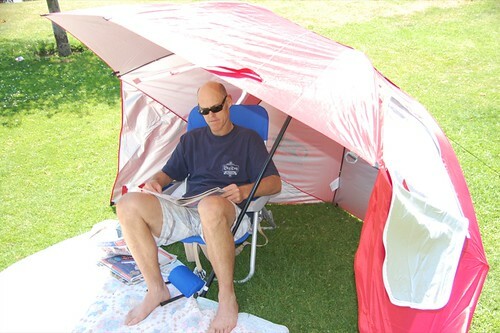 The Sport-Brella experientially overviewed today is one such product that met the above criteria AND it offers instant portable shelter from the sun, rain, and wind with SPF 50+ quick shade protection! The Sport-Brella made people think I was cool (clever play on words alert), less existential, and the owner of beautiful skin. Maybe my overview will be more effective if I proffer anecdotal evidence. So I took the Sport-Brella to the park. I read the directions, then handed them to The Rock who does all my putting togethering. He laughed when he read, “Easy set-up. Goes up in less than three minutes.” Because The Rock is a realist, and the last sun shade protection we had never got folded back together because collectively we could not figure out how to do it. (The sun shade before that got me banned from the local park because I spent 45 minutes swearing as it kept popping open in my face.) So The Rock made me time him (I swear to God). And I did and in less than three minutes the whole thing was up and I smugly said “I TOLD YOU SO!” even though I secretly thought the three-minute thing was a steaming pile of marketing mumbo jumbo. Here is The Rock trying to nonchalantly act like he didn’t think the Sport-Brella lied. The above picture is from a park where we spent the day with Toots and Booger. It was a day like any other where I forget to pack snacks and water and expect the girls to play with other kids’ sand toys because I forgot to pack those too. As is usually the case when The Rock and I take the girls somewhere and think they might play with kids and some such like, they instead crawl all over us and accidentally knee The Rock below the waist. 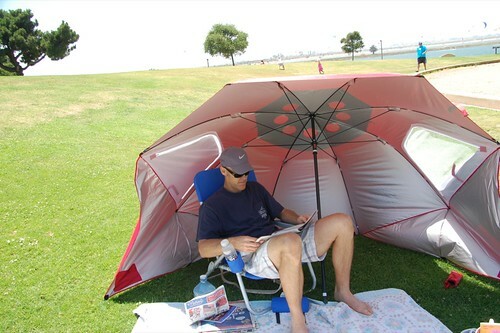 I’m happy to say that during these memorable family times, we all fit comfortably under the Sport-Brella, which provided us with ample shade and nice airflow through the vented screen flaps. On another occasion, we took the Sport-Brella to our afternoon Fourth of July festivities, where we met our best friend rich couple who gives us the most wonderful gifts ever and we agonize every Christmas over what to do. Seriously, we’ve gone the homemade route, the “Maybe they don’t have a bear rug?” route, and the “I know $500 is a lot to spend, but we’re desperate here,” route. I promise each and every one of you that this couple has everything. There is nothing you can tell them about or buy them that they do not already own 18 of already. So when Mike, the male counterpart of the best friend rich couple, said, “Hey! Where’d you get that?” while pointing to the Sport-Brella, I thought the cockles of my heart would burn up right then and there. He liked the color, he said, he liked that it set up easily, he said, he liked that it was a canopy and an umbrella and sun shade all in one, he said, and he liked that it didn’t blow away like his last umbrella. Here’s The Rock trying to nonchalantly pretend he’s not a realist. I don’t know, something real catchy and pertinent like that. In related news, I think I’m getting real good at these experiential overviews! Clearly, I will need to do more. I know the Sport-Brella people will think so. P.S. 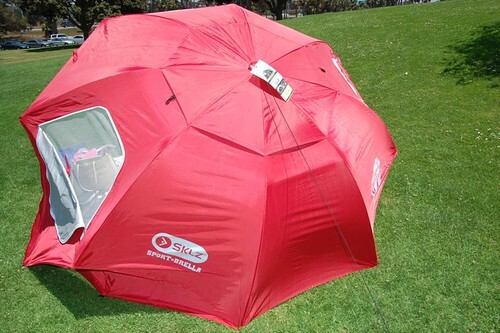 Link to the Sport-Brella is here. Price is $69.99 (but I’ve seen them at Costco for less). UPDATE: Costco is sold out. ANOTHER UPDATE: Sport-Brella’s marketing director says: our marketing mumbo jumbo actually claims 3 seconds, not 3 minutes. And yes, to open it and lay it on the ground, it should take you 3 seconds. Even for a….The Rock. However, to do the complete set up it takes a minute or two. You’ll be down to 50 seconds next summer. I’m so buying a Sport-Brella because I’m certain it will provide ample cover for my toe. I’m not even kidding. Also? You know how you’re watching a movie and the characters are at a ballgame eating hotdogs and you just gotta have a hotdog? No? Well, it happens to me all the time. Anywho. After seeing The Rock sitting under the Sport-Brella? I just gotta have a Sport-Brella, too. Finally? You know how Tom is uber-competitive and stuff? Well, he wants a Sport-Brella because he thinks he can put it up in less than two minutes. ditto Cheri–I am sooo buying one of those! Your writing is just that persuasive. And my husband gets kneed in the nether region 50 times a day too and often looks for cover. Great experiential overview! Now, that’s my kind of marketing! Great job!! 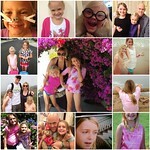 I saw the photo in your Flickr stream and had to find out what it was all about. I love it! 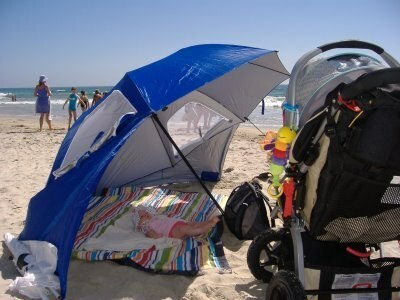 Do you think it would provide adequate shelter during the summer months? I mean, if I wanted to camp out in your backyard? Excellent review, I mean overview. But if I may…. how about a link and the price? Because I need one! It does look fantastic, but for those of us in Minnesota where the sun only flirts with us 2 months a year (and lately not even that often) $70 is waaaay too much to spend. I enjoyed your overview though! that thing looks pretty darn cool. And ya know, I thought I was the only mom that forgets snacks and water for the park. Glad to hear that I am not alone! I like it! If we ever went to the beach, it would come in handy. The fact that we drive next to the beach EVERY FRIGGING DAY has no bearing on the fact that we never go to the beach. Fabulous overview! If I’d had one of those as a kid, I might not be covered with all these brown, ugly AGE spots due to the fact that I laid out on the roof of my house covered in baby oil! Oh, those were the days! If I had a family of 4 or a husband to put that thing together in 3 minutes, I’d certainly buy one just because your overview is so damn convincing. But, alas, I bet I could get it together by my lonesome in about 30 minutes! Ha! All at the same time I thought they were ridiculous looking, and I wanted one because they’re functional and cool. Like crocs. I don’t care how comfortable they are, they make you look like dumbass. Same with the sport-brella, only The Rock really doesn’t look like a dumbass there at all. He looks wise, cool, and quite comfortable. I should re-think those crocs, huh? The rock has nonchalance down to a fine art, the rich couple will simply HAVE to buy one! Oh, I’m seething with jealousy. The SPORT-BRELLA? Perhaps I can rig one of these up above my doublewide’s front door so my porch has some shade … wadda ya think? Sporty! i am kind of in love with whoever wrote you that stuff about reviewing with humor and nuerosis. but that bikini and hat are pink, not red, right? and so if the sport-brella is pink? i’d like to borrow it just so that the Sailor would have to come up with a plausible reason that he can’t sit under it. other than it being pink. but that would be the real reason. just so we’re clear. I’m curious about the rain protection it provides. Seems allot easier to take camping than a big rain/screen tent. We use our Sportbrella mostly for our son’s soccer games – keeps me from getting burned on sunny days AND works GREAT for the rainy/windy weather here in Washington! The Sportbrella is my FAVORITE soccer game day accessory!!! I just bought one of these for $39.99 at Costco! If it holds up to Southern Utah desert winds I’ll be a believer. This held up great in moderate wind. I would recommend it. It was nice to have a sun shade that could be easily moved throughout the day. It does block wind, but more useful for the sun as dust seems to blow around and into the sportbrella if there is loose dirt and/or sand. Loved it! However, it was put away inside the garage since last summer. We used it for the first time last Sunday and to our surprise when I opened the umbrella the black plastic end pieces to witch the shade is attached to the frame crumbled into pieces all but one did not fall apart. I was very embarrased as I was with a group of friend who I had recommended it to. We returned the umbrella to Costco without a problem. I don’t know if it was a defective one. Although I went through a lot of trouble and embarrasement I really like it, and I’m actually looking at purchasing another one. I am a little undesided because I’m afraid I’ll have the same problem.